Much, if not most, comics storytelling concerns the ongoing exploits of series characters. Also, many newspaper comic strips, and most comic book series, have involved adventure or fantasy. It's not surprising, then, that over the decades, the Arthurian legend has been a rich source of material for writers and artists in creating new stories of their own series characters. And since most comics series have a contemporary setting, Arthurian elements are often introduced through some form of time travel, with the "Connecticut Yankee" device of sending a modern-day character back in time to Camelot being the most common. The entries are presented in alphabetical order by the name of the comics character or group of characters in whose series the stories take place. Publication information is presented where possible. DC Comics' All-Star Squadron series, published in the 1980's, related the exploits of the Justice Society of America and their costumed colleagues (including the Shining Knight) in World War II. The fourth issue (Dec., 1981) answered the question of why the American superheroes didn't bring an end to the war immediately after Pearl Harbor, describing how a villain called the Dragon King used the power of the Holy Grail and the Spear of Destiny (held by Hideki Tojo and Adolf Hitler, respectively) to turn the heroes against each other when they entered territory controlled by the Axis. The Grail was lost sometime after the war, and the Dragon King began a decades-long search to recover it which eventually brought him into conflict again with the Shining Knight, as told in Stars and S.T.R.I.P.E. #11 (June, 2000). The Anachronauts are a group of heroes from different time periods who, from their base in a centuries-spanning city called Chronopolis, investigate anomalies in the time stream. Among their number is Sir Raston, nephew of the original Black Knight, and like him a wielder of the Ebony Blade forged by Merlin from a meteorite called the Starstone. In a back-up story in Avengers Annual vol. 1, #22 (Marvel Comics, 1993), the Anachronauts visited Camelot to prevent the theft of the Starstone prior to its discovery by Merlin. DC Comics' "King of the Seven Seas" met King Arthur (as well as Morgan Le Fay, Merlin, and Viviane, the Lady of the Lake) in Adventures in the DC Universe #15 (June, 1998). In this story, Aquaman was transported back in time to aid Viviane in her attempt to prevent Morgan from stealing the sword Excalibur before it could be claimed by Arthur. A few years later, the Sea King was involved in a storyline (beginning with Aquaman vol. 6, #1, 2002) in which he was chosen by a mysterious figure identifying herself as the Lady of the Lake to be a conduit for the healing power of the "Secret Sea". Aquaman has also been associated with the Arthurian legend in more subtle ways. The Atlantean monarch, whose "surface-world" name is Arthur Curry, has occasionally been referred to as "King Arthur." For another undersea ruler's Arthurian encounters, see the entry for Namor, the Sub-Mariner. These allied superheroes (published by Marvel Comics since 1963) have at various times counted Captain America, Iron Man, and Thor (as well as the Black Knight) among their number. In addition to their Arthurian adventures with the Black Knight and Modred the Mystic, the Avengers met Merlin (later deemed to have been an imposter) in Avengers v.1, #10 (reprinted in hardcover in Marvel Masterworks: The Avengers, Vol.1, and in black and white paperback format in Essential Avengers, Vol. 1), and also battled against Morgan Le Fay and Mordred on several occasions. They came to the aid of Spider-Woman in her struggle against Morgan in v.1, #240-241, and stood against Morgan and Mordred when the former of the two villains magically transformed the modern world into a medieval world in which she ruled as queen (Avengers v.3, #1-3, 1998 ; reprinted in trade paperback as Avengers: The Morgan Conquest and in the hardcover collection Avengers Assemble, Vol. 1). Morgan returned in Avengers v.3, #80-81 (2004), in which the Avengers joined the new Captain Britain in thwarting the sorceress' scheme to usurp the power of Avalon and destroy England. More recently, Morgan has appeared in issues of Mighty Avengers (#9 and 11, 2008) and Dark Avengers (#1-4, 2009) which explore her relationship with the modern-day arch-villain Doctor Doom, as first introduced in issues of Iron Man (discussed below). 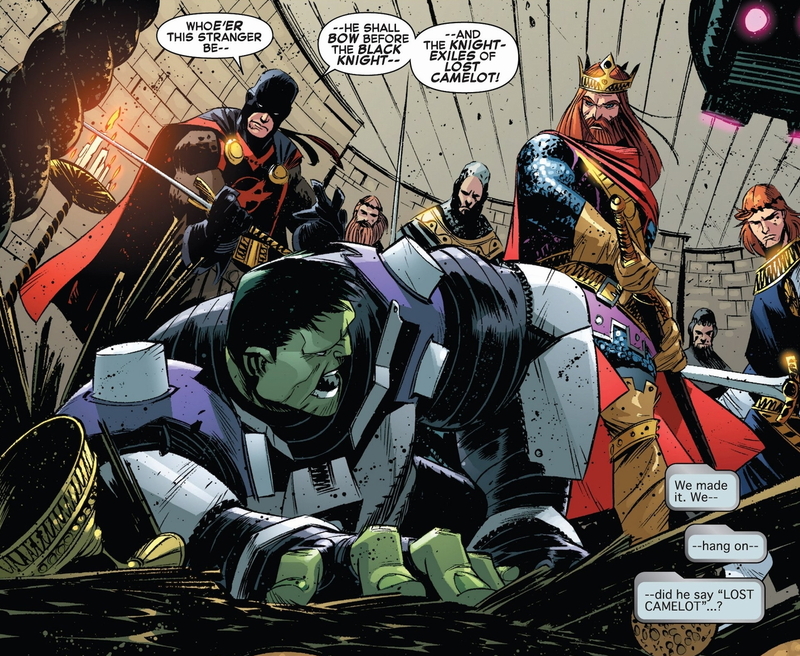 Her most recent attempt at world conquest came in several issues of Avengers World (2014) which also featured the Black Knight. In an earlier adventure, the "West Coast" version of the team came to the aid of the super-team Excalibur at the behest of the Lady of the Lake. Additionally, an incarnation of the team aimed at younger readers joined the Black Knight in opposing Morgan Le Fay in Marvel Adventures: The Avengers #10. Marvel has also published Avataars: Covenant of the Shield (2000), featuring medieval-fantasy versions of the Avengers and other Marvel heroes dwelling in the realm of Avalon on an alternate Earth. The well-known hero of Gotham City (published by DC Comics), became "Sir Batman at King Arthur's Court" in a story by that title that appeared in issue #36 of the regular Batman series (Aug./Sept., 1946). Batman and Robin traveled through time to the Sixth Century and joined Lancelot and the other Round Table Knights to rescue Merlin from the hands of Mordred and Morgan Le Fay. Batman also journeyed to Camelot with Superman in World's Finest, and he has encountered Merlin's demon, Etrigan, on a number of occasions. (In one "Elsewords" story, in fact, Batman/Demon: A Tragedy , the title characters are merged, while Batman's faithful butler Alfred is conflated with Merlin.) In December, 1999, DC Comics published the graphic novel, Batman: The Chalice, in which Batman became a reluctant guardian of the Holy Grail. 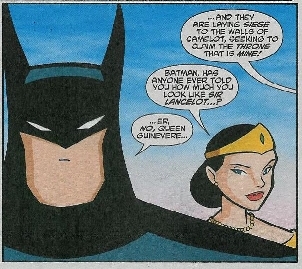 The story implied a possible familial connection between Batman (Bruce Wayne) and Sir Gawain of the Round Table (in this reader's interpretation, at least). 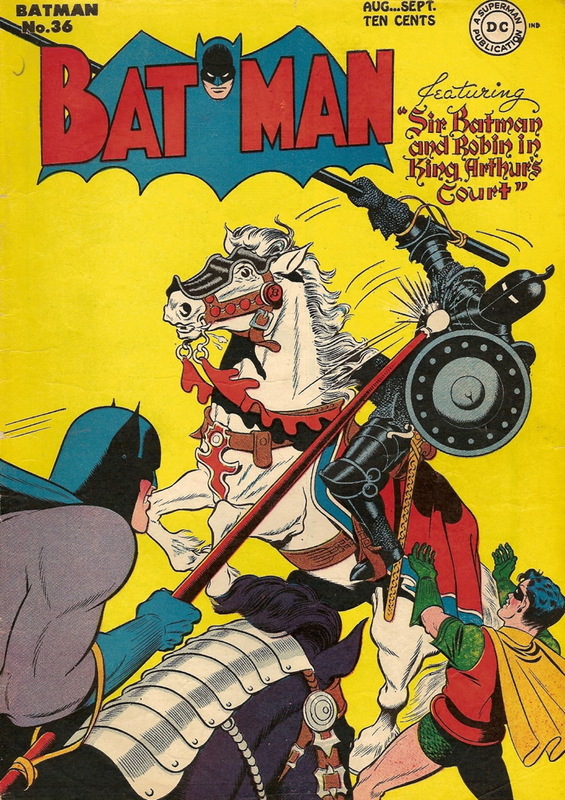 Contemporary comics writers as well as filmmakers often refer to the Batman as a "dark knight", and the character has been re-imagined as a literal Arthurian knight on at least two occasions. In Tangent Comics: The Batman (Sept., 1998) DC Comics introduced a new character with nothing in common with the familiar hero save the name. This Batman is the spirit of Sir William, a knight of King Arthur's time, animating a suit of armor to battle evil in present-day London. William had turned against Arthur at the behest of his wife, who turned out to be a disguised Morgan Le Fay, and William was cursed by Merlin to dwell a prisoner in his own castle, only emerging in spirit as the Batman, until he can atone for his crimes. A somewhat more traditional Batman appears in Batman: Dark Knight of the Round Table #1 and 2 (1999), an "Elseworlds" story in which Bruce of Waynesmoor is one of the male children banished by Arthur in an attempt to eliminate the threat of Mordred. Bruce's parents are slain at sea by Morgana Le Fay, and Bruce grows to manhood swearing vengeance on both Morgana and Arthur. Given the guise of the Batman by Merlin, Bruce ultimately plays a key role in the final conflict between Arthur and his ememies. In issues #35-40 and Annual #2 of her second series, Batwoman teamed with a number of other characters, including Etrigan the Demon, to thwart a plot by Morgaine Le Fey to conquer the world using the power of the "Sorceror's Stone". introduced in a four-issue miniseries, The Books of Magic, written by Neil Gaiman (reprinted as a single-volume trade paperback in 1991). In this story, four powerful magic workers (including John Constantine) took Tim Hunter on a tour of magic in the DC Universe, including a visit to a young Merlin in the years before Arthur's kingship (issue #1, 1990). Following a run of seventy-five issues (plus annuals, spin-off miniseries, etc.) of an ongoing Books of Magic title, Tim Hunter returned in the 2001 five-issue miniseries The Names of Magic. In this story, written by Dylan Horrocks, Tim underwent a quest to discover the truth of his identiy and origins which eventually led him to a cave at Tintagel (King Arthur's legendary birthplace) and another encounter with Merlin (issue #5). Tim learned that Merlin had created him in his dreams to serve (as Merlin had) as a conduit for magic, "the power once called the Myrddin -- the Merlin" and to battle the darkness that threatened to extinguish not only magic, but all Creation. Tim's story continued in Hunter: The Age of Magic. 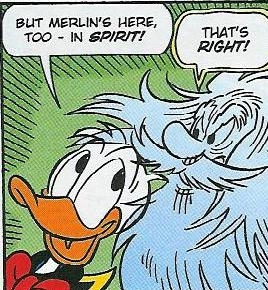 In the early issues of this series, Merlin appeared as Tim's confidant and mentor of sorts, in the form of an owl familiar. Merlin apparently perished in issue #16 (December, 2002). Marvel's third hero to bear the name Captain Marvel (none of whom bear any relation to the original "Marvel Family" character discussed below) became involved with a plot by Merlin (the "imposter" version introduced in Thor #96) to summon Grendel's mother (from the epic poem Beowulf) to aid him in his quest for the Holy Grail in Captain Marvel v.5, #20-21 (2001). The sardonic seaman Corto Maltese has been a fixture of European comics for years in adventures written and illustrated by Hugo Pratt. In Corto Maltese: A Mid-Winter Morning's Dream (published in book form, in English, by NBM in 1987), Maltese stands in for King Arthur to foil a German ("Saxon") plot against Britain during World War I, fulfilling a purpose laid out for him by the island's Faery guardians, who include Morgana and Merlin. 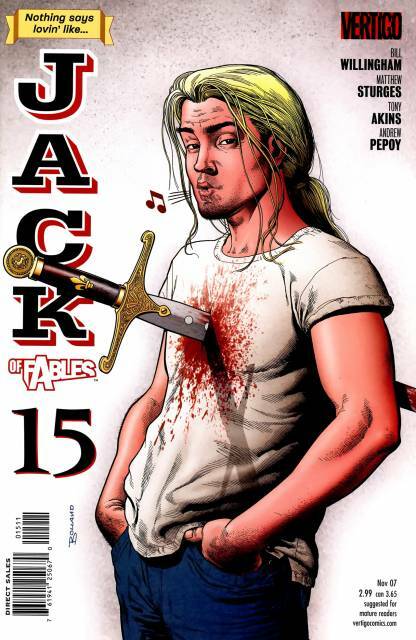 The titular hero, a contemporary mercenary, was healed of a mortal illness by the Holy Grail in a story running through issues 6 - 9 of his eponymous Image Comics series (1994). Marvel Comics' sorcerous superhero Dr. Strange met Lancelot du Lac while time-traveling in a story that appeared in Marvel Premiere #14 (March, 1974; reprinted in black and white in Essential Doctor Strange, Vol. 2). Later, Strange joined the Avengers in aiding Spider-Woman against Morgan Le Fay (Avengers vol. 1, #240-241). In the third and fourth issues of Doctor Strange, Sorcerer Supreme (March and May, 1989), Strange met Dafydd ap Iowerth, a middle-aged Welsh scholar who is revealed as the Pendragon -- perhaps a reincarnation of Arthur, perhaps his spiritual heir. (See the entries for the Knights of Pendragon and the Black Knight for other modern "Pendragons" from Marvel Comics.) A back-up story in the eleventh issue of the same series (December, 1989) relates the role of Morgan, Merlin, and Modred the Mystic in the history of the Darkhold. The space-and-time-traveling adventurer known only as the Doctor, introduced in a BBC-TV television series in 1963, has long appeared in comics as well. He aided Arthur and Merlin in battle against the hordes of Catavolcus on a future Earth in "The Neutron Knights" (Doctor Who Magazine #60, Marvel UK, 1980; reprinted in Doctor Who #14, Marvel, 1985) and encountered Merlin again in the sequel, "The Tides of Time" (Doctor Who Magazine #61-67, Marvel UK, 1980; reprinted in Doctor Who #15-18, Marvel, 1985-1986). A very different approach to the Matter of Britain was taken in a story published (in the United States) in Walt Disney's Mickey Mouse Adventures #7 (Dec., 2005), when Donald, along with his lady duck friend Daisy, encountered the spirits of Morgan Le Fay (also a duck) and Merlin (a human this time, though as indicated by the illustration to the right, not much resembling the famous version in Disney's The Sword in the Stone). Although this fantasy manwha (Korean comic) series by Hong Seock Seo was primarily set in a legendary version of 6th Century Korea, the setting for one storyline, "The West," ranged as far as Camelot. Wandering dragon hunter Kok-Jung was enlisted by Merlin to hunt Siegfried's dragon, but the wizard turned out to have ulterior motives, and Kok-Jung and his companions had to face the power of both the dragon and Merlin when they both pursued Kok-Jung home to Korea. Other familiar Arthurian characters appeared in this story, including Arthur himself (pictured), as well as the original character of Riah, Arthur's illegitimate daughter, a warrior in her own right who wields an "astral version" of Excalibur. "The West" was originally published in South Korea in 2002, and was reprinted in English translation in 2005 by Tokyopop in volumes 9 - 11 of their Dragon Hunter series. Merlin and Avalon were ongoing story elements in this super-team comic book series created by Bill Willingham (later to create Fables) and published sporadically through the 1980's and 1990's by Comico, beginning with the appearance of a boy wizard named Ambrose in Elementals v.1, #19. This wizard was eventually identified as Merlin Ambrose of Camelot, Regent of the realm of Avalon. In Elementals v. 2, #7, Ambrose changed his appearance into that of a handsome young man and wedded one of the team's members, Morningstar. In "The Sword In The Stone" (Morningstar Special #1, April, 1990), Morningstar visited the tomb of King Arthur in Avalon. Jack Kirby, the creator of the Demon, also featured Arthurian elements in other series of his creation (see the entry for The Forever People below). 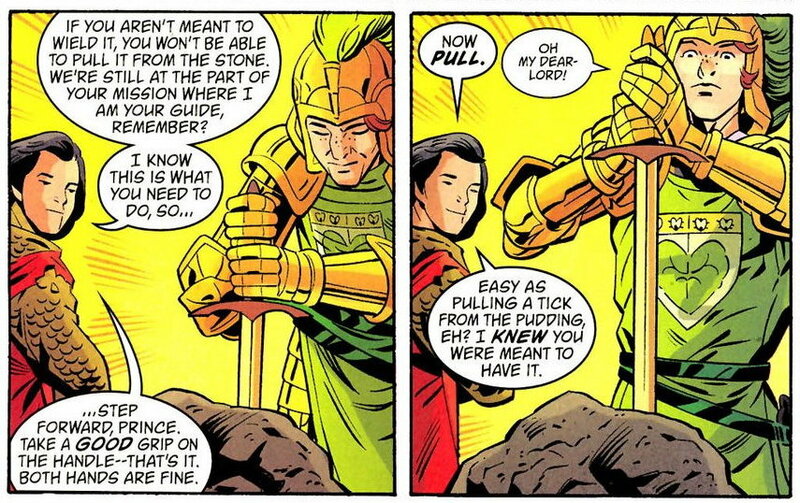 The Eternals were an advanced, immortal branch of humanity who were the basis for various mortal myths and legends. In The Eternals #4 ( October, 1976), Sersi (Circe) described how she visited Camelot and showed Merlin a few new tricks. The premise of writer Bill Willingham's long-running Vertigo (DC) series Fables (2002-2015) -- that the characters of fairy tales, legends, and nursery rhymes are real, and that many are now living in our own mundane world, having fled here from their Homelands to escape a powerful Adversary -- makes the entire world of folklore (and other public domain literature) available for the author's use; and indeed, Arthurian elements have appeared sporadically since the series' beginning, occasionally becoming important to the storylines. 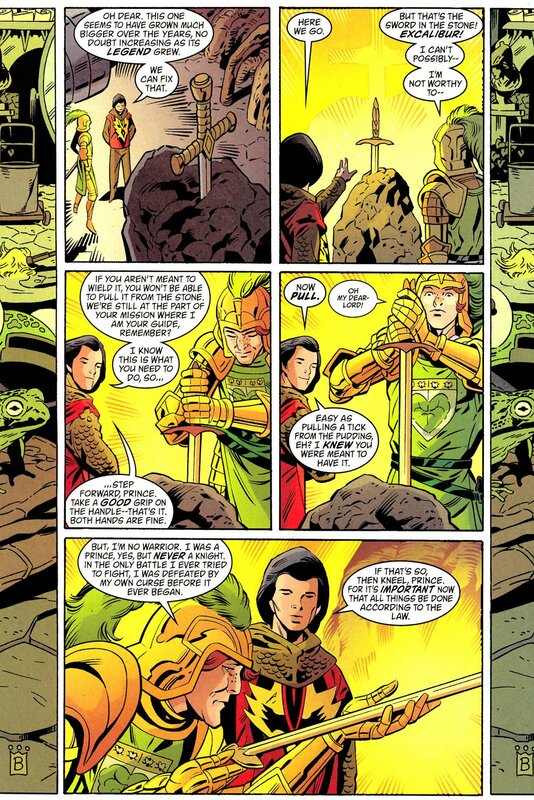 In early issues, a sword in a stone appeared in the background in scenes set in the business office of Fabletown (the New York City enclave of the folktale characters, or "Fables"), as did the Forsworn Knight, a figure in full medieval body armor hanging by his neck from a noose. Not until the story arc "The Good Prince" (originally published in issues #60-63 and #65-69 of the monthly series, and later reprinted in trade paperback) did readers learn than the Forsworn Knight was in fact the ghost of Lancelot, who had hung himself in remorse for having helped cause the fall of Camelot through his illicit affair with Guinevere. In this story, Lancelot came forward to assist Ambrose, the Frog Prince, when the latter regained his memory after serving for years as a janitor in Fabletown. Lancelot gave him his armor and led Ambrose to pull the sword, Excalibur, from the stone, then knighted him with it. Lancelot then joined Flycatcher on a quest to strike against the Adversary and create a new peaceful kingdom in the Homelands. This short-lived version of Marvel's Defenders superhero team featured a roster composed entirely of women. Appropriately enough, the series' primary villain was also a woman, Caroline Le Fay, who was revealed in issue #4AU (2013) to be the daughter of Morgan le Fay and Doctor Doom, a surprising development built on events depicted years earlier in issues of Iron Man and Avengers. This one-time professional thief, a sometime member of Marvel's X-Men team of mutant superheroes, was coerced into stealing the sword Excalibur from its current bearer, Dr. Faiza Hussain (also known as Excalibur) leading to a confict with the hero Excalibur and her fellow MI:13 agents (including the Black Knight) in in Gambit v. 5, #6-7 (2013). The Disney animated television series Gargoyles, which originally aired from 1994 - 1997, related the adventures of a clan of living gargoyles, returned to life in modern New Your City after having been frozen in stone for a thousand years. Over the course of its run, an extensive background was developed for the series which incorporated various elements from mythology, legend, and history. King Arthur was brought back to life from an enchanted sleep in one episode, and recovered Excalibur in another. Following the TV series' cancellation, series creator Greg Weisman continued the storyline in comic books that were published by Slave Labor Graphics, beginning in 2006. A three-part story involving the gargoyles, King Arthur, and the Stone of Scone (here identified with the stone from which Arthur drew his sword) appeared in 2007 - 2009. The first two chapters were originally printed as issues #7 and 8 of the Gargoyles comics series; following the series' cancellation in 2008, these chapters were collected along with the unpublished third chapter in the trade paperback Gargoyles: Clan-Building, Volume Two, which appeared in August, 2009. DC's "Emerald Archer," a contemporary masked crimefighter, met a carnival fortune teller named Merlin who later turned out to be (probably) the genuine article in "The Curse of the Wizard's Arrow!" (Adventure Comics #261, June, 1959). A few months later, Green Arrow and his boy sidekick Speedy visited 6th Century Camelot in "The Green Arrow in King Arthur's Court" (Adventure Comics #268, Jan., 1960), in an adventure which may have been "real," or just a dream inspired by Mark Twain's A Conneticut Yankee in King Arthur's Court. (Both stories were reprinted in black and white in Showcase Presents Green Arrow, Vol. 1.) Many years later, in Green Arrow v. 5, #1-14 (2010-2011), the emerald archer encountered a mysterious armored figure who believed himself to be Sir Galahad. Although ultimately turning out not to be the "real" Knight of the Round Table, this present-day Galahad nevertheless proved himself a worthy bearer of the name in a storyline that also featured Etrigan the Demon. The first of several DC superheroes bearing the name of Green Lantern traveled through time for an Arthurian adventure in "Rumors of the Round Table"(All-American Comics#72, April 1946). The hero and his sidekick Doiby Dickles encountered Merlin (a friendly charlatan) and a "dragon" who was revealed to be Roger Bacon, experimenting with gunpowder. John Constantine, a character first introduced in DC/Vertigo's Swamp Thing, is a chain-smoking, trenchcoat-wearing English sorcerer. 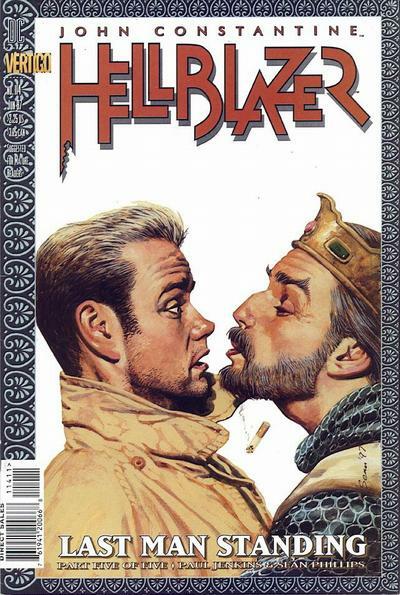 In Hellblazer Annual #1 (1989), writer Jamie Delano told the story of the title character's (implied) fifth-century ancestor, the Constantine traditionally depicted as Arthur's successor as King of Britain. This Kon-sten-tyn was, like Arthur, a pupil of Merlin, but unlike Arthur, developed magical prowess and eventually surpassed, then imprisoned, and eventually (apparently) destroyed Merlin. Kon-sten-tyn struggled all his long life to resist the Christian suppression of the old pagan ways, and by the end of his life, had achieved a secret victory. An altogether different interpretation of Arthurian legendary materials was offered by writer Paul Jenkins in the "Last Man Standing" storyline which ran in issues #110 - 114 of the regular Hellblazer series (Feb. - June, 1997). Here Merlin appeared as Mr. Meardon, who in league with government leaders had begun tearing down ancient mystical landmarks of Britain. Opposing him, Constantine encountered a group of Arthur's knights (based on the Welsh tradition of the Mabinogion, rather than on Malory) -- like Meardon (or Myrddin), remnants of an eternal race older than humankind. Constantine learned that Arthur himself had been a human granted eternal life by God, along with the secret of why God forsook Myrddin's race, his first children. Arthur had placed the knowledge into a box -- the Grail -- and disappeared. In the present day, Constantine's friend Rich the Punk was revealed as Arthur's heir and the achiever of the Grail, and Constantine outwitted Meardon at the last, effecting an ultimate reconciliation between Arthur and Myrddin. These two "Hellblazer" stories, while very different, are both among the most original and provocative Arthurian stories that have appeared in American comics. The demonic, but heroic, paranormal investigator created by writer-artist Mike Mignola has appeared in two feature films as well as multiple comic-book miniseries. In the 2008-2009 eight-issue miniseries Hellboy: The Wild Hunt (reprinted in trade paperback in 2010), Hellboy enountered Morgan Le Fay and learned that in addition to being the son of the demon Azzael, he was descended on his mother's side from Morgan and King Arthur through their son Mordred, and thus "the rightful king of England." 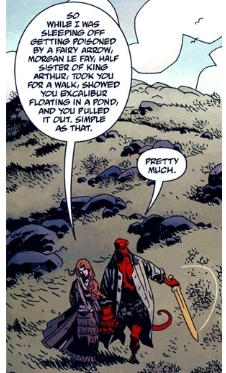 In the course of the storyline, Hellboy drew the sword Excalibur from a stone in a lake, and was told that he was destined to raise an army of Britain's noble dead against the resurrected witch Nimue. The story continued in two follow-up three-issue miniseries, Hellboy: The Storm (2010) and Hellboy: The Fury (2011; both miniseries were reprinted in the 2012 trade paperback Hellboy: The Storm and the Fury). The noble dead of Britain did indeed begin to rise in opposition to Nimue, massing as an army ready to follow Hellboy, but Hellboy ultimately rejected his prophecied role, and abandoned Excalibur. The sword was then given to an ancient World War I veteran named George Washbrook, who, rejuvenated by its magic, took King Arthur's crown and used the power of the Holy Grail to restore the army of risen British soldiers' corpses to true life. This new king led his army in defense of Britain against Nimue's monstrous horde while Hellboy took the fight to the "Queen of Blood" herself in her otherworldly castle. leading to an epic, apocalyptic conclusion with major ramifications for Hellboy and his world. Marvel's gamma-irradiated green behemoth traveled through time to the Arthurian age in the Indestructible Hulk #12-13 (2013) as part of a multi-issue storyline in which the Hulk journeyed to different eras to save history from a group of "time terrorists" called the Chronarchists. The Hulk was joined by King Arthur, Merlin, the Black Knight, and other Knights of the Round Table in his struggle to set things right once more in Camelot. Dark Horse Comics published Indiana Jones and the Spear of Destiny as a four-issue miniseries in 1995. The story is a sequel of sorts to the film Indiana Jones and the Last Crusade, and features Indiana and his father Dr. Henry Jones on a quest for the Spear of Longinus with extensive reference to the Grail lore associated with Glastonbury, England, as well as to the familiar premise of the Nazis' interest in mystical relics. A Marvel superhero inspired by the martial-arts fad of the 1970's, Iron Fist was featured in numerous issues of the black-and-white magazine The Deadly Hands of Kung Fu as well as in his own color comic. In the third chapter of a six-part serial in the former publication (issue #21, Feb., 1976), Iron Fist encountered a mysterious character named the Bowman, who identified himself as a servant of the Firebird, the "mystic soul of Man." Iron Fist and the Bowman fought alongside one another in the following issue (#22), and in the serial's last chapter (#24) the Bowman revealed himself as Lancelot, seeking penance for his role in Camelot's end by serving the Firebird through eternity. This serial was written by Chris Claremont (co-creator of Captain Britain and Excalibur) and drawn by Rudy Nebres. In the 1990's, Iron Fist became a teammate of the Black Knight in the short-lived Heroes for Hire series. Iron Man also crossed paths with Morgan Le Fay in the present day in #209 (Aug., 1986). In this story, following her attempts to re-enter the mortal world through Spider-Woman, Morgan's spirit temporarily possessed the sister of Jack Russell, the "Werewolf By Night", having been drawn by the Russell family's connection to the Darkhold. Iron Man also joined the Knights of Pendragon in several of their adventures, and was summoned by the Lady of the Lake to aid the super-team Excalibur against Dr. Doom. In 2008, Marvel published yet another sequel to the original Iron Man - Doctor Doom Arthurian adventure. 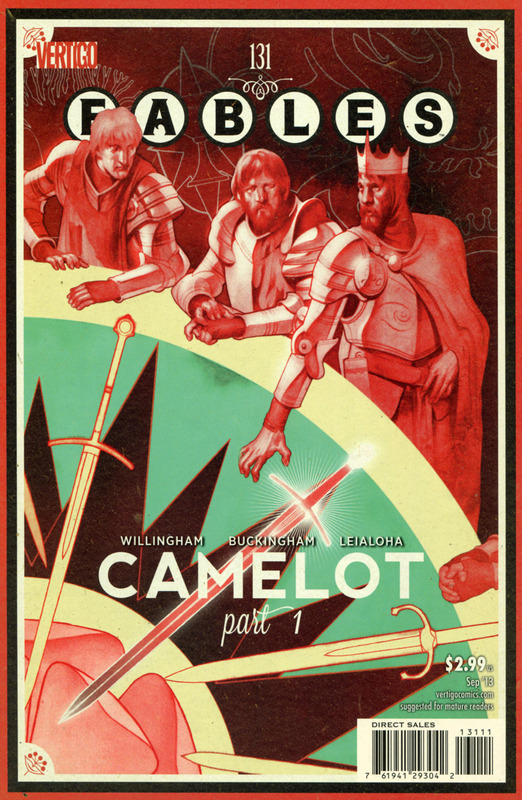 Billed as the conclusion of the "Camelot Trilogy", this four-issue miniseries (later reprinted in both hardcover and trade paperback) was entitled Iron Man: Legacy of Doom, and featured the two armored characters in a modern-day battle over the sword Excalibur that also involved Merlin and Morgan Le Fay. According to the Arthurian Annals, "Superman's pal" Jimmy Olsen drank a potion concocted by Merlin and was transformed into "The Wolf-Man of Metropolis" in Jimmy Olsen #44 (National Periodical Publications/DC Comics, April, 1960). According to the same source, as well as DarkMark's Superman index, Jimmy had an even more Arthurian adventure a few issues later when, while attending a costume ball as a knight, he was sent back to King Arthur's time by the fifth-dimensional imp Mr. Mxyzptlk, and encountered Merlin himself (another imp), as well as Arthur, Guinevere, and several Knights of the Round Table (issue #53, June,1961). 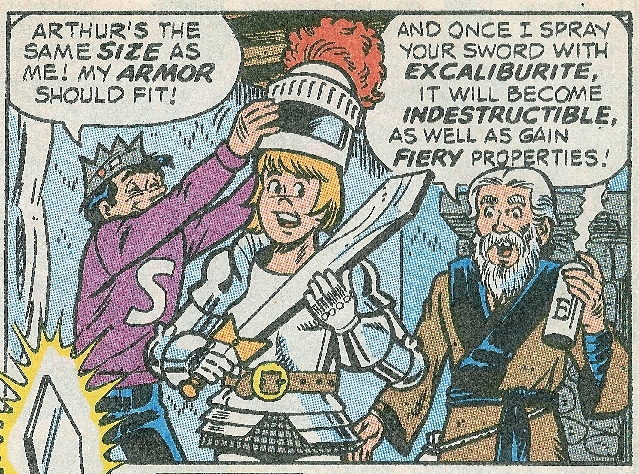 Archie Comics' beanie-wearing, food-loving teenager, Jughead Jones, dreamed he was Sir Jugalot, a knight of Camelot, in Jughead's Fantasy #1 (Aug., 1960). (Source: Arthurian Annals.) Thirty years later, as a member of the Time Police -- an organization dedicated to preserving the integrity of history -- Jughead traveled to the Arthurian era in pursuit of a rogue Time Police agent, Morgan Le Fay, in Jughead's Time Police #2 (Sept., 1990). In the course of the adventure, Jughead encountered the founder of the Time Police, Merlin, who had retired to the Middle Ages, and Merlin's apprentice Arthur. In the course of thwarting Le Fay, Jughead and his fellow agents helped Arthur ascend to the throne. 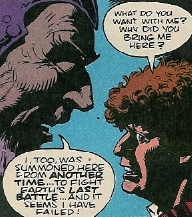 Morgan returned for another appearance in issue 6 (May, 1991). The hell-goddess "bad girl" character created by Brian Pulido and Steven Hughes in 1991 has appeared in a number of versions from a variety of publishers since her debut in 1991. Lady Death: Re-Imagined (Chaos! Comics, 2002) presented a version who began as Faith, the daughter of a Grand Inquisitor in 13th century Burgundy. When her father sought to gain immortality and power by stealing the Holy Grail from a group of Knights Templar, Faith attempted to stop him by seizing the Grail first and drinking from it. However, the Templars' leader had placed a curse on the Grail in an effort to thwart the Inquisitor's aims, and so Faith became Lady Death -- immortal and powerful, but soulless as well -- whose first act was to slay her father. Martin Mystere is an unusual detective, created by Alfredo Castelli in 1978 for Italy's Bonelli Comics line, who investigates mysteries involving ancient civilizations, UFOs, secret societies, and a variety of strange phenomena. 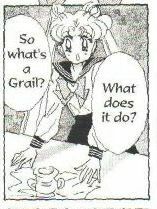 Several of his adventures have involved the Holy Grail, according to Mariano Tomatis' "The Holy Grail" web site. 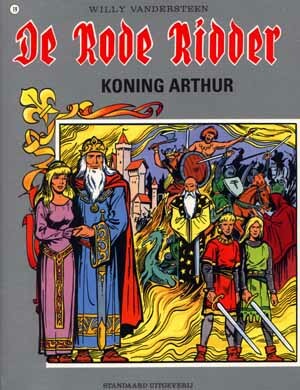 In another adventure, "The Sword of King Arthur" (scripted by Castelli, and reprinted in English in 1999 by Dark Horse Comics in Martin Mystery #3 and 4), Martin found the sword Excalibur and traveled through Europe on a quest to uncover its secrets with his ruthless nemesis, Orloff, in pursuit. Eventually, at Stonehenge, the detective learned the truth behind the Arthurian legends, which turned out to involve an ancient and lost technology as well as a long-ago visit to Earth by unfriendly aliens. 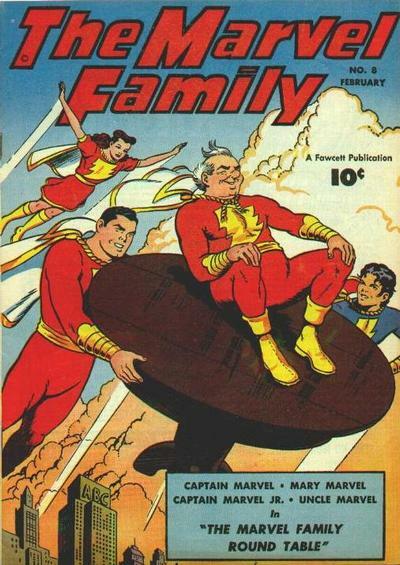 According to the Arthurian Annals, the original Captain Marvel and the other members of the Marvel Family discovered King Arthur's Round Table in The Marvel Family #8 (Fawcett, Feb., 1947). Much more recently, in the 12-issue miniseries The Trials of Shazam (DC Comics, 2006-2008), Freddy Freeman, the former Captain Marvel, Jr., competed for the right to inherit the powers of the wizard Shazam against Sabina, the representative of a group called the Council of Merlin. Merlin himself appeared in the series' final issue, portrayed as a demonic figure complete with horns. For the Arthurian adventures of another Atlantean superhero, see the entry for Aquaman. This short-lived super-team series from Eclipse Comics included a young sorceress code-named Avalon among its main characters. In issues #7 - 9 (Sept. - Oct., 1986), readers learned that Avalon, or Elizabeth, was actually the daughter of a priestess from the enchanted island of Avalon. Morgana, the Lady of Avalon, summoned Elizabeth home, and the rest of the team journeyed there to retrieve her. The story (written by Mindy Newell) appeared to have been considerably influenced by Marion Zimmer Bradley's novel, The Mists of Avalon. This short-lived Marvel Comics series (Dec., 2005 - May, 2006), which took its name from the better-known World War II-based series Sgt. Fury and his Howling Commandos, featured a unit within the contemporary superspy organization S.H.I.E.L.D. which was composed entirely of monsters and other supernatural entities. In a storyline that spanned all six issues of the series' run, Merlin escaped from a S.H.I.E.L.D. containment facility in the United States and traveled to Great Britain, transforming it into an otherworldly medieval realm, which he ruled until defeated by the Howling Commandos. Comics illustrator-storyteller Dave Dorman introduced some of the concepts that would become part of the world of "The Wasted Lands" in the comics anthology A1 (v.2, #4, Marvel/Epic Comics, 1992). In Dorman's eight-page story "The Edge", an adventurer traveled by motorcycle through a dystopian, railroad-dominated desert land to claim a fragment of the stone that once held Excalibur. In subsequent years Dorman slowly added to his mythos, introducing new characters and concepts through trading-card paintings and short stories (illustrated by Dorman, scripted by Del Stone, Jr.). In 2001, Image Comics published Rail: Broken Things, in which Dorman and Stone told the story of how Edgar Wallace, the Edge, first encountered the Lady of the Lake and received both the sword Excalibur and a quest. The Edge was charged to recover all the fragments of Excalibur's stone and reconstruct it so that "the one true king' would be revealed when he once again drew the sword from the stone. Both stories, along with Dorman and Stone's other, non-Arthurian material set in the same world, were reprinted in hardcover as Dave Dorman's Wasted Lands (Magnetic Press, 2014). The Red Knight appears in a long-running series of graphic albums in Europe; as Robert Vermaat writes: "De Rode Ridder is a mega-opus by Willy Vandersteen, with the first album appearing in 1959 and still going strong, even when Vandersteen died a few years ago. Johan, the Red Knight, is a knight from an unspecified period in time, dealing with adversaries and monsters all over the world and of all ages. Chinese, UFO's, you name it. Of the 150+ albums, only a few relate adventures concerning King Arthur, Merlin or one of the Knights of the Round Table." Like Prince Valiant, the Shining Knight, or the original Black Knight, the Red Knight qualifies as a "new" Knight of the Round Table, though neither his origin story nor the majority of his subsequent adventures are Arthurian. Marvel Comics' Rom series, based on a Parker Brothers toy, chronicled the adventures of an armored alien "Spaceknight" who had come to Earth to battle the equally-alien but malicious Dire Wraiths. In issue #37 (Dec., 1982), Rom was struggling to rescue children held captive by Dire Wraiths in a castle that had once belonged to Morgan Le Fay, when a spectral King and his band of knights (unnamed, but implied to be Arthur and the Knights of the Round Table) came to his aid. In 2000, Marvel debuted Spaceknights, a series featuring Rom's sons Balin and Tristan (both names of Round Table Knights). Slaine is a Celtic barbarian hero created for the British comic magazine 2000 AD by Pat Mills and Angela Kincaid. In a story arc written by Mills and painted by Dermot Power, Slaine was brought through time by Morgaine and Merlin following the battle of Camlann to search for the lost Treasures of Britain and bring them to the undying Arthur in Avalon (pictured here). Once the Treasures had been restored, Arthur could, in Morgaine's words, "become the once and future king and heal the land!" As Slaine quested for the Treasures, flashbacks related the story of Arthur and his kingdom. Mills and Dermot's work is a highly original (though violent) interpretation of the legend, drawing heavily on Welsh sources, and offering a unique interpretation of Guinevere as a sinister but tormented figure. The story was originally published in 2000 AD in 1996-1997 and has been reprinted in trade paperback as Slaine: Treasures of Britain. A subsequent adventure of Slaine, set in southern France in the 1200's, found the time-traveling hero questing for the Grail Stone in the company of Simon de Montfort, leader of the Albigensien Crusade against the Cathars. This storyline, written by Mills and painted by Steve Tappin, draws liberally from modern ideas about a historical connection between the Cathars and the Grail legends, as well as from Wolfram von Eschenbach's German poem Parzival; at the same time, it retains the influence of Celtic paganism (or, more accurately, contemporary notions of such). The story originally appeared in 1997-1998 and has been reprinted in trade paperback as Slaine: The Grail War. Todd McFarlane's Spawn, published by Image Comics since 1992, tells the story of a man who makes a deal with a devil and becomes both a Hellspawn, destined to be a soldier in Hell's war against Heaven, and a superheroic champion. Issue #9 introduced Count Cogliostro (apparently based on the historical charlatan Alessandro, conte di Cagliostro), a mysterious old man who attempted to counsel Spawn. Cogliostro was eventually revealed to be an immortal Hellspawn himself, who had foresworn the cause of Hell. In the second issue of the spin-off series Spawn: The Dark Ages (April, 1999), Cogliostro introduced himself to a Hellspawn of medieval England, stating that he had been called many names in his time: "... Merridyn... Merlin... Prospero... Cogliostro..."
The first of several heroines to bear the name Spider-Woman, this character's early exploits were published by Marvel from 1978 to 1983 in an eponymously-titled series. Spider-Woman (Jessica Drew) had been raised on Wundagore Mountain in Europe, where centuries earlier the Elder God Chthon had been imprisoned by Morgan Le Fay and her minions. Jessica had been touched by the power of Chthon and the sorcerous book called the Darkhold, thus making her a target for Morgan in the present day. Spider-Woman fought several battles with Morgan, beginning in Spider-Woman vol.1, #2. Probably the most memorable encounter appeared in #41, "Le Morte de Jessica" (Dec., 1981), in which Jessica temporarily found herself living Morgan's life in Camelot. The conflict appeared to reach its culmination in issue #50, the series' final issue, in which Jessica Drew apparently died -- although her conflict with Morgan would actually be resolved on a more positive note some months later with the aid of the Avengers. Starslayer, written and drawn by Mike Grell, presents the story of Torin Mac Quillon, a Celtic warrior drawn through time from the Roman invasion of Britain to help save Earth in the far future. The first issue (Pacific Comics, Feb., 1982), set prior to Torin's temporal journey, features his encounter with the "Druid necromancer" Ambrosius, who prophesies that though the Romans may conquer Britain, "the dragon shall rise again," and who then sets a sword through a stone and anvil to wait for a future king. This comic book about a clandestine superhero team made its debut in 1993 as an Image Comics publication, but moved to DC Comics some years later. In 2011 , Stormwatch was woven into DC's freshly rebooted fictional continuity, "The New 52", and given a new history and origin. This new version of the team was led by an immortal named Adam One, eventually revealed to be Merlin. Readers ultimately learned that the origins of the Stormwatch team lay in the Middle Ages, with the adventurers known as the Demon Knights. Stormwatch v.3, #0 chronicled Merlin's assemblage of various versions of Stormwatch over the centuries, and a 19th-century version featuring Adam One appeared in a back-up feature in All-Star Western v.3, #17-21. Adam One was apparently killed in Stormwatch v.3, #5, but later issues revealed his translation onto another plane of existence by his other-dimensional masters, the Shadow Cabinet. In Superman v.2, #55 (May, 1991; reprinted in trade paperback in Superman: Time and Time Again), a time-lost Superman appeared at Camelot during Morgaine Le Fey's final assault on Camelot (as originally portrayed in The Demon vol. 1, #1) and was temporarily bewitched into Morgaine's service before being restored to his right mind by Merlin. Etrigan the Demon also appeared in this story, which conflicts with some other accounts of Jason Blood's origins. An "Elseworlds" story, Superman: Kal (1995), presented a scenario in which the infant Kal-El (Superman) arrived on Earth in the Dark Ages. Merlin appeared in the framing sequence of this story as the young apprentice of Kal's friend, Master Jamie Ollson (Jimmy Olsen), and the story also offered an extraterrestrial origin for the "sword in the stone." In earlier stories, Superman visited Camelot in a dream in Superman v.1, #38 (Jan./Feb., 1946), and also traveled there in a sequence in his newspaper comic strip in 1949. (Source: The Arthurian Annals.) The character also traveled to the time of Camelot with Batman in World's Finest #162, and accompanied the Justice Society of America and the Shining Knight on a similar jaunt in All-Star Comics v.1, #48-49. 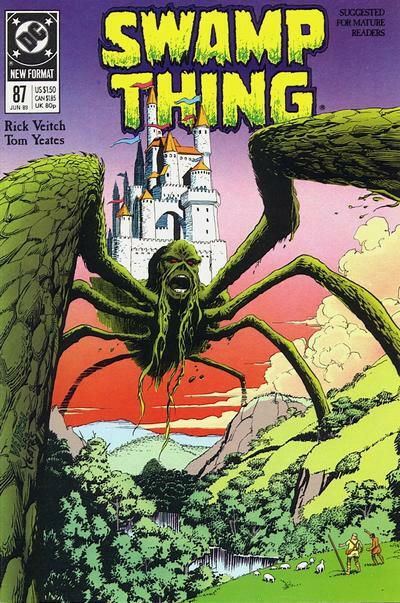 The Swamp Thing, an elemental spirit of the plant world, was unwillingly sent on a journey through time which, in "Fall of the House of Pendragon" (Swamp Thing #87, DC Comics, June, 1989) brought him to Camelot. Queen Guinevere, Merlin, Morgaine, Modred, and a wounded and mentally ill King Arthur all appeared in this downbeat but memorable story, in which Swamp Thing inadvertently hastened Camelot's fall. DC's Arthurian characters Etrigan the Demon and the Shining Knight also had roles in this tale. 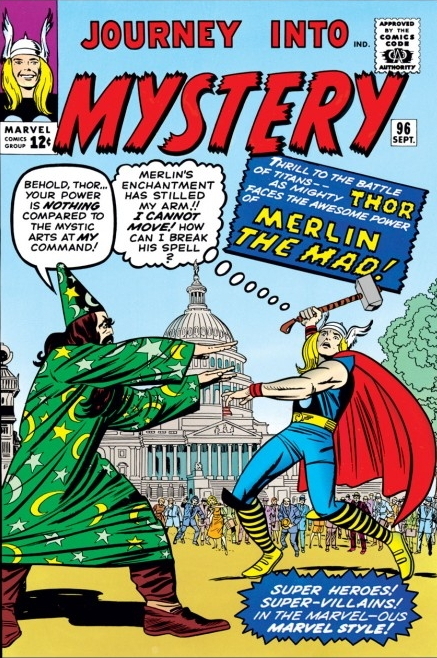 The Mighty Thor, Marvel Comics' version of the Norse God of Thunder, battled "The Mad Merlin" in an early adventure published in Journey Into Mystery #96 (1963; reprinted in hardcover in Marvel Masterworks: The Mighty Thor, Vol. 1, and in black & white paperback format in Essential Thor). 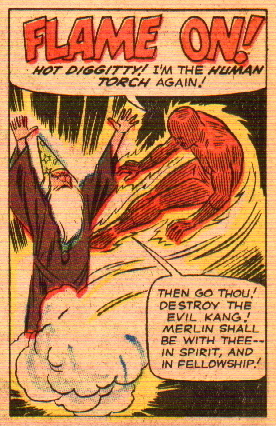 This Merlin was eventually revealed in later stories to be a mutant, the Maha Yogi, who had impersonated the true Merlin. Many years later, in Free Comic Book Day 2011 (Thor The Mighty Avenger), Thor and his fellow Avenger Captain America traveled through time to Camelot to rescue the real Merlin (who this time was being impersonated by Thor's scheming brother Loki), meeting King Arthur and Sir Gawain along the way. In 2012, King Arthur and Merlin turned up in issues #639-641 of Journey Into Mystery (at that time a companion series to the main Thor title, starring Loki), as the lords and defenders of Otherworld (including Captain Britain) sought the aid of the Norse pantheon against an insurgency by a divine manifestation of modern British industrialism, the "Manchester gods". Thor has also encoutered Arthurian characters in group adventures with the Avengers over the decades, as well as in the Fantastic Four: Atlantis Attacks crossover. Marvel's team of supervillains seeking (at least sometimes) to redeem themselves and become heroes made a "Connecticut Yankee" journey to Camelot in issues #169-170, (2012), meeting Arthur, Merlin, the Black Knight, and others. DC Comics' time-traveling adventurer Rip Hunter battled a centuries-long conspiracy of the Illuminati in the 1990 miniseries Time Masters. In issue #5, Hunter sent an ally to 10th century Europe to help another DC hero, the Viking Prince, steal the Holy Grail from the Illuminati leader, Vandal Savage. The popular video game "Tomb Raider" has been adapted for comics in a number of titles from Image Comics. Tomb Raider #5 and 6 (2000; reprinted in the trade paperback collection Tomb Raider, Volume 2: Mystic Artifacts, and in the U.K. in Tomb Raider: The Merlin Stone) relate Lara Croft's adventure involving a mystic portal into the time of the dinosaurs. The portal turns out to be associated with the Merlin Stone, a magical artifact with which Merlin could see through time and which Morgan LeFay has been searching for for centuries. In issue #6, Morgan (who has been masquerading as an archaeology student) attempts to seize the stone. A later story, published as Tomb Raider #1/2 (2001), reveals that Lara has also searched for and acquired King Arthur's crown. Lara Croft also appears in the Dark Crossings miniseries which introduces the Butcher Knight. The working-class patriotic British superhero (and one-time Knight of Pendragon) attempted to stop a band of vampires from seizing the Holy Grail in Marvel's 1998 - 1999 three-issue Union Jack miniseries (collected in trade paperback in 2002), written by Ben Raab and illustrated by John Cassaday. According to Michael Torregrossa's "Camelot 3000 and Beyond", Merlin appears in two flashbacks within the pages of Vampire Bayne, Lord of the Night vol. 2, #1 (1996). Antarctic Press' Warrior Nun Brigantia (2000) is a three-issue miniseries derived from the publisher's ongoing Warrior Nun Areala series. In 1940, the head of the ancient king Bran the Blessed has been stolen from Britain by Fata Morgana (Morgan le Fay) and delivered to Nazi Germany. Since legend says that Britain cannot be invaded only so long as Bran's head remains there, the British government calls on Brigantia to recover the head. Meanwhile, a warrior nun from the time of Camelot awakens to join the battle -- Arthur's own sister Anna, the White Nun. This series includes some interesting ideas, but the execution is disappointing. This Image Comics series chronicles the adventures of Sara Pezzini, a New York police detective who possesses the "Witchblade", an ancient mystic weapon which can only be wieled by a female warrior. Witchblade #50 revealed that the Witchblade has a "male" counterpart, Excalibur, which came to be possessed by Sara's sometime ally, Ian Nottingham. Sara Pezzini also appeared in the Dark Crossings miniseries which introduced the Butcher Knight. Diana, the super-powered Amazon princess from Paradise Island, time-traveled to Camelot and helped King Arthur defeat the evil Merlin and rescue Queen Guinevere in Wonder Woman #54, according to Mikel Midnight's Earth-2 Timeline. Later, in issue #184 (September-October, 1969), Diana visited another dimension to seek the aid of Arthur and other legendary heroes (including Siegfried and Roland) against the army of the God of War, Mars. 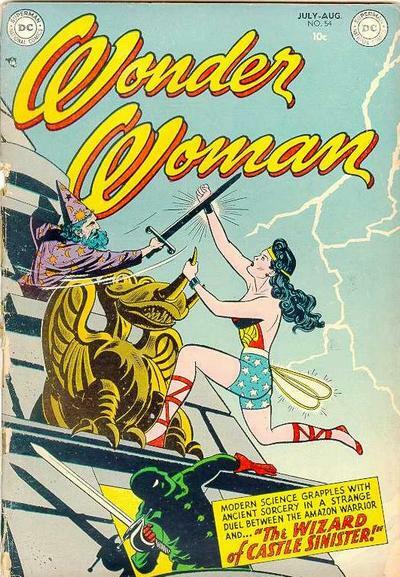 Also, as described in Part Three, Wonder Woman has been involved in Arthurian adventures with the Demon, where Morgaine Le Fey has been her primary adversary. 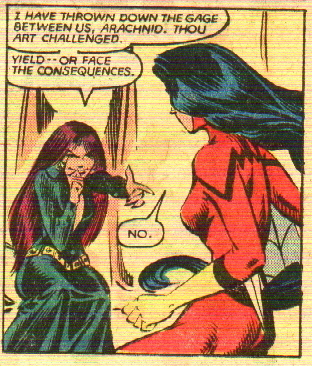 Diana's adversarial relationship with Morgaine was recently revisited in the 52 issues of DC Comics' weekly series Trinity, which also starred Superman and Batman. In the story "Pawns of the Jousting Master" (issue #162, National Periodical Publications/DC Comics, November, 1966), Superman and Batman were drawn back in time to assist the heroes of Camelot against an invasion by aliens from outer space (some sixteen years before Camelot 3000). The knights of the Round Table were presented as a medieval superhero group, with Arthur's invincible sword Excalibur and Gawain's strength increasing towards noon being joined by other, less traditional "super-powers" including invulnerable armor for Lancelot, a cloak of invisibility for Kay, and a flame-emitting ring for Bors. According to the Xena Comic Books Website, the three-issue miniseries Xena: Warrior Princess and the Original Olympics (June - Aug., 1998) features an athlete from Brittany named Arthur who is accompanied by his friend Lance as he attends the ancient Olympics and competes against Samson and others. Since the Xena television series takes considerable chronological liberties with ancient history and mythology, one may assume that this comic based on the series is doing the same in portraying Arthur and Lancelot as contemporaneous not only with the Olympics, but also with the Biblical hero Samson. 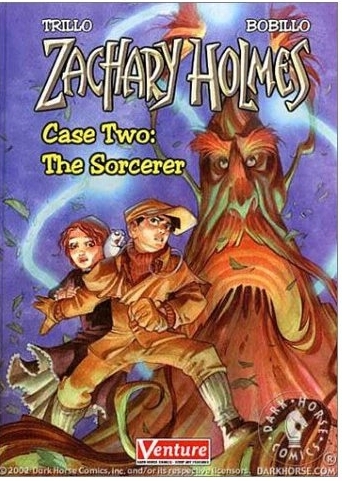 Young detective Zachary Holmes and his mouse assistant Watson were enlisted by Holmes' friend Diana and the tree-bound spirit of Merlin to stop an evil ghost, Lord Moriarty, from killing Queen Victoria with the sword Excalibur in Zachary Holmes - Case Two: The Sorcerer (published in the U.S. by Dark Horse Comics, 2002). The spirits of King Arthur and Robin Hood also appear in the story, which is probably most memorable for its depiction of Merlin as an anthropomorphic tree. Last updated 9/20/15. E-mail your comments and suggestions to the author, Alan Stewart .